Do you love those extreme home makeover shows that highlight a family moving into their dream home? When you enter a space, do you notice what is around you? Do you like to do detailed work, as well as be part of a team? Are you creative? If you answered “yes” to the questions above, a career in interior design may be for you. Tidewater Community College’s interior design program provides a foundation in both commercial and residential spaces. It is one of two programs offered within Virginia’s Community Colleges, providing an affordable option to private design schools. By completing the two-year associate degree, students gain skills in many areas, including visual presentation, space planning, color theory and selection, material selection, estimating and construction documentation. Students learn the latest in computer-aided design software, including AutoCAD, Revit and Chief Architect. In addition, students have the option of classroom instruction, online and hybrid courses so they can find the best fit for their needs. TCC’s online interior design program was recognized among the nation’s best by BestOnlineColleges.org. All classes include end-of-class presentations that demonstrate the latest in design and drafting software, time-tested hand drawing methods and product samples from local sources. Students often design projects for actual clients, ramping up learning to the real-world level. “In these instances, students interview clients, determining their living style and special needs before designing spaces that are both livable and functional,” Hopkins said. right, works with a student. 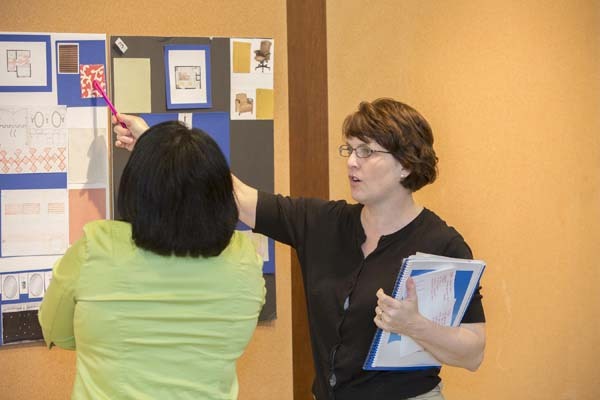 TCC associate degree graduates are prepared to enter the design industry and sit for the National Council for Interior Design Qualification exam, the path to professional interior design certification. In addition, the TCC program also offers specialized career study certificates in associate designer, kitchen and bath design and green design for interiors. TCC’s student chapter of the American Society of Interior Designers provides students with supplemental portfolio building activities, including a pallet challenge, where students turn discarded shipping pallets into works of art. In recent years, students worked with Tidewater Builders Association and local builders to showcase new homes during Homearama, completing the hand renderings of homes that are in the promotional brochure for the event. TCC graduates are qualified to work as residential, commercial or hospitality designers. They can also work as design specialists for furniture stores, real estate sales representatives or staging professionals. Some work in architectural firms, design product lines or open their own firms. For more information on TCC’s interior design program, contact Jennifer Hopkins at jhopkins@tcc.edu or 757-822-5183.